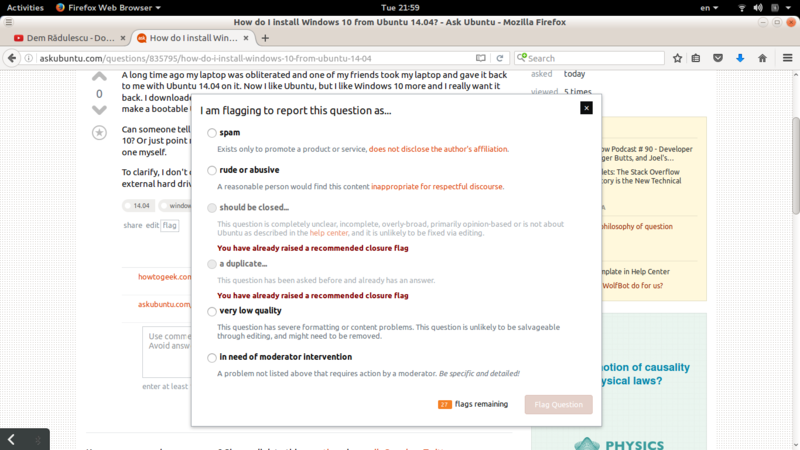 Today, I have flagged a question as being off-topic here (as the question seemed to be more about Windows than about Ubuntu), then, I had a second thought (the OP was a beginner in Ubuntu and closing down his question might be a reason for disappointment and confusion, and besides of that, we should admit that, sometimes, beginners are not yet prepared for the change, so they do want to go back to Windows). Now, where is the good old button saying me to retract the flag? I can't see it. How can I cancel my flag in this situation? Note: You may question my reasons regarding my flagging behaviour, I admit that, but the technical problem is still on. You can't retract the flag because it has already been processed. Once the flag has been processed (and marked "helpful" or been declined), there's no way to retract the flag. The flag in question has already been marked as "helpful", and is no longer eligible for being retracted. You can see your list of pending, helpful, and declined flags (as well as retracted flags) by going to your user profile, going to the "Activity" tab, and then clicking where it says "### helpful flags", which will then bring you to your flags list, which will contain a list of your helpful, declined, disputed, pending, or retracted flags. From there, you can see if it's been processed. Any "pending" flag can be retracted. Others cannot be.